This book popped up on my radar sometime last year, where I promptly added it to my to-be-read list, making a mental note to pre-order from overseas as soon as it became available. It's probably one of my most anticipated reads of 2016. 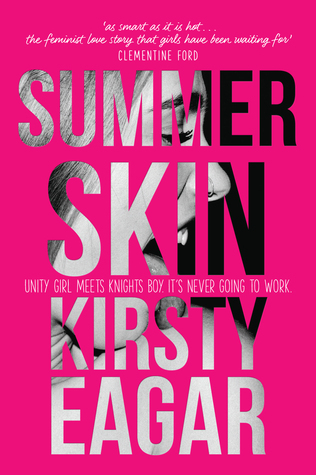 Kirsty Eagar is an Australian writer, who's books I wish were more readily available to US readers. Her stories are not impossible to get though. If you have some patience, trust me when I say this, they are so worth the wait -- and Summer Skin is worth every single penny, every single minute, and so much more. What I loved so much about this story is Jess's unashamed ambition. She's a strong girl, with a good head on her shoulders, who begins this story wanting to seek revenge for a friend who's been mistreated. What she does is both bold, and daring, and possibly a bit questionable. My first reaction was, !!! (insert words I cannot say without revealing too much). The boy who ends up being the target for her revenge has an air about him, both mysterious yet cocky. I knew there was a deeper story to his being, and I was determined to figure it out. It's a slow build between Jess and Mitch, who circle each other for quite a bit, claws out and ready to strike. But every once in awhile the world falls away and we see a softer side to their harsh edges, something so much deeper and richer, waiting to be extracted. As the story progresses, so does Jess's lingering questions. What she thought she knew of herself and who she stood for begins to shift, shining a new light on someone she's not so certain about, but definitely curious to explore. This story is meant for mature readers, and I highly recommend it to those who seek strong female leads that are not afraid to be who they are. Not only was this novel my most anticipated read of 2016, it's quite possible my most favorite read of the year, too. Summer Skin is every bit delicious, empowering, and irresistible. As soon as that last page turns, I end up wanting more and more from Kirsty Eagar, like always. Such an immense pleasure to have stumbled across this book. Beautifully, poetically written, sometimes I just wanted to read it aloud to hear the words flow. Flawed, relatable characters, particularly Jess. Can't say enough good things, just go read it!